The potential of slate and tile rooftops has finally been realised in the UK as they’re becoming more popular up and down the country. With their durability, excellent weather resistance and long life expectancy you’ll have a reliable roofing material suitable for all conditions. And with a range of colours and styles to choose from you have the opportunity to select something unique that will match well with your existing home and even set your roof apart from the rest of the street. Because of the huge benefits you can make the most from with a tile and slate roof, it’s imperative to have any issues repaired quickly to avoid unwanted hassles. With a product lasting over 75 years and not affected by rust, rot or insects, tile and slate rooftops are a fantastic investment. Choose from a wide variety of colours and styles to make your roof stand out from the crowd and find something that matches the original infrastructure. 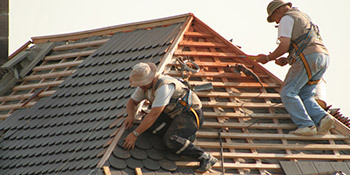 By keeping your tile or slate roof well maintained you’ll ensure it lasts for many years, adding durability, uniqueness and a long lasting finish to your rooftop. For up to four FREE quotes from local, vetted and reputable companies just complete our quick form and hear from the professionals. Project: Need roof tiles cleaning not gutters as we are having new ones the roof is not to bad just want it tidying up. Project: Quote for removing moss from house roof and garage roof. I recommend this company. They were quick to reply and so very helpful, Great customer service and will definitely use them in the future. Very prompt (same day contact and visit) arrived on time and completed work to my complete satisfaction and on the agreed price. Fast, friendly and efficient service. Would recommend. Immediate reply and completion of the job. My garage roof is now watertight and sturdy.. Quotation were very helpful and I am thoroughly satisfied with their service and the service of the contractors..